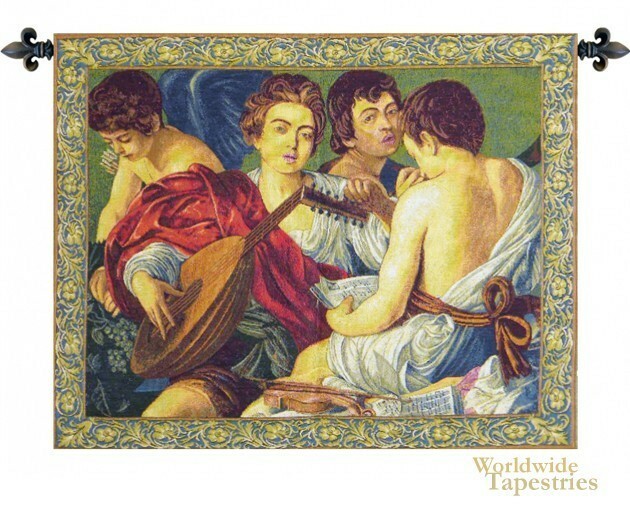 The Concerto Caravaggio or Concert of Youths tapestry is based on the painting by Michelangelo Merisi da Caravaggio from 1595. In this Baroque piece we see musicians including a lutist and singer, the original of which is in the Metropolitan Museum of Art in New York. There is also a violin in the foreground. The piece is considered a secular work and shows these musicians in their white robes accented by crimson and one of them, to the left, possess wings and is reaching towards some grapes. This Renaissance tapestry La Primavera is backed with a lining and a tunnel for easy hanging. Note: tapestry rods and tassels, where pictured, are not included in the price. Dimensions: W 26" x H 23"